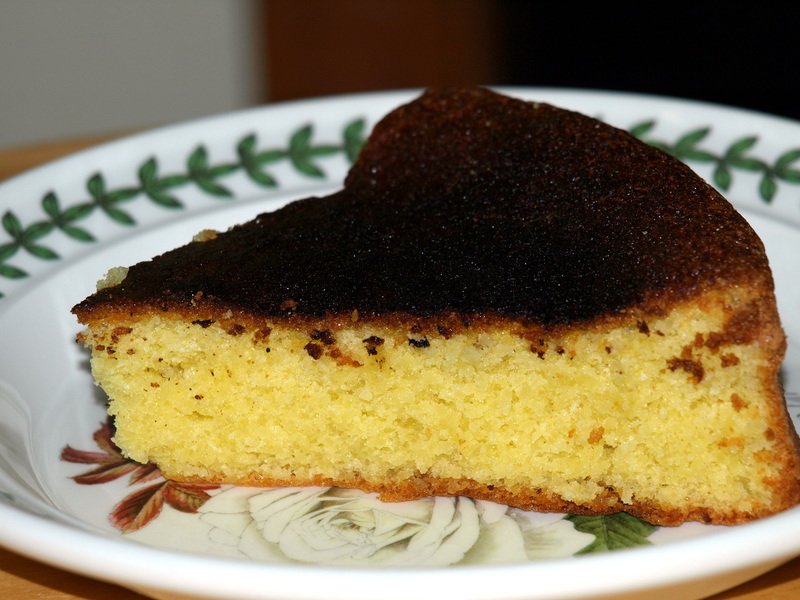 The cake contains no flour and no added fat other than what is provided by eggs and ground almonds. Eaten warm, it is light and fluffy. After a day or two, it mellows, becoming denser and more moist. It makes an excellent breakfast cake or afternoon treat. Preheat oven to 350. Grease and flour an 11-inch springform pan (line bottom with parchment if desired.) In a food processor, finely grind almonds. With a stand mixer, whip egg whites to stiff peaks. Transfer whipped egg whites to a large mixing bowl. In the stand mixer bowl, beat egg yolks and sugar for several minutes, until the mixture is light in color and texture. Add zest and/or lemon oil and almond extract. Stir in the ground almonds, mixing well (will be very thick). Fold the almond-egg mixture into the egg whites until no streaks of white remain. Pour mixture into the prepared springform pan, smoothing the top. Bake for 40 minutes; cake should feel firm to the touch. Cool in the springform pan before unmolding. Yields 10-12 slices. Thanks for this post ; I will send the recipe to my brother and his daughter since both of them are gluten intolerant and this is a dessert they might like to make. Isn’t it nice to find gluten-free recipes that don’t require special ingredients? Sounds like a great dessert. I’m always looking for GF treats that don’t taste GF. I’ll have to give it a try. Do you think I could sub a 1/2 pound of almond flour for the ground nuts? Sure, a finely ground almond flour should work just fine. If you can only get the coarse kind, try whizzing it a bit in the food processor before using it.